FilSurf School is a licensed business and permitted surf school. We maintain the operation requirements of the Portuguese Surf Federation, Turismo de Portugal, I.P. (Portugal Tourism), The Instituto da Conservação da Natureza e da Biodiversidade, I.P. – ICNB (Institute for Nature Conservation and Biodiversity) and Capitania do Porto de Lagos (Captaincy of the Port of Lagos). During the weekends FilSurf provides lessons for local kids and teenagers, who are interested to learn first steps of Surf/Longboard or who already do surf and wants to improve technique and to participate in surf competitions. 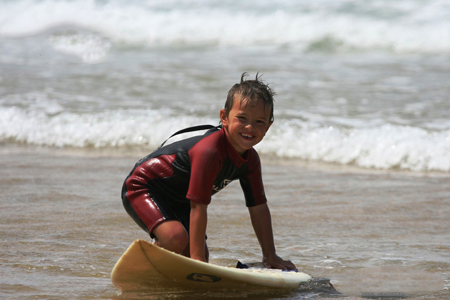 Our team of certified instructors will teach essential fundamentals and will work with your kids individually on their surfing technique to ensure that they learn to surf the correct way, without creating “bad habits”. 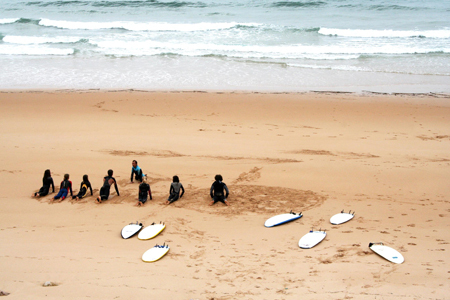 Beginners start with the basics of water safety, board handling, positioning, paddling, stand up and wave selection. Kids’ safety is before everything! The site is determined by our instructors to optimize kids’ safety, fun and learning experience. Intermediate surfers can benefit from advanced lessons from our instructors on bottom turns, top turns, cut-backs, barrel riding, reading swell directions, conditions, surfing etiquette and more! Get some tips for picking the right equipment. It’s very easy to purchase the wrong surfboard. Many people do exactly that. The wrong surfboard for training can make your investment a waste of money. The professional advice of our instructors will help you to pick the right board for your kids’ level. For advanced surfers we offer competitions lessons where kids can learn contest strategy and try it on the practice competing in the local national competitions during FilSurf lessons. Every Saturday at 10:00am FilSurf School is providing departures from the Lagos’ Sailing Club (Clube de Vela de Lagos) to the south or west coast depending on wind and swells conditions. Important to bring: Surfers need to bring an appropriate waterproof and sweat proof sun filter. Come already wearing your swimsuit and bring a towel, sunglasses, hat and dry and warm clothing to change after surf lesson. We recommend sunscreen of SPF 30-50. Bring your surfboard and wetsuit, healthy lunch, snacks and a drink. Pocket money if needed, as most of the beaches have a beach bar. What Is Included In A Kids Academy Lesson? It is forbidden to eat and drink inside the van. It is forbidden to enter the van with wet wetsuits or boots. The students should leave their personal belongings tidily and safely within the van. Professional tips and the exciting trip. 12€ (10€ annual insurance payment and 2€ payment for the FPS plastic card). If you already have your FPS sport insurance plastic card from the last year, please bring the card and 10€ annual insurance payment. WHEN BOOKING ACADEMY LESSONS PLEASE CONTACT US 24 HRS PRIOR TO THE DAY OF THE LESSON TO ENSURE THAT REQUIREMENTS ARE MET.